Synopsis: If you broke Elena’s heart, Star Wars would spill out. So when she decides to queue outside her local cinema to see the new movie, she’s expecting a celebration with crowds of people who love Han, Luke and Leia just as much as she does. What she’s not expecting is to be last in a line of only three people; to have to pee into a collectible Star Wars soda cup behind a dumpster or to meet that unlikely someone who just might truly understand the way she feels. I just read this adorable little story in around half an hour – and I’m so glad I did! Rainbow has this lovely, unique, recognizable style of writing which really shone through right from the start; and made me want to carry on reading until the end! Kindred Spirits is basically a short story about nerds, for nerds. It’s a mini celebration of nerd-ity, and no one could possibly do it better than the author of much loved YA novel, Fangirl. I love the diary, day-by-day layout of this little book! And the characters…ah, the characters. I love Gabe – and I actually have a friend who reminds me of him – and I don’t understand how Rainbow can make you love characters so much in such a short space of time! That author has serious skill. This story is cute, sweet and funny. Okay, scratch that. 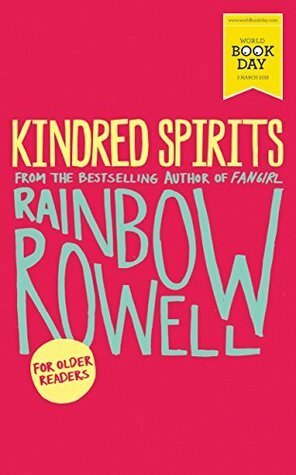 And if you love Rainbow Rowell as much as I do, you need to pick this up. Stop caring that it’s only 62 pages long and will only take you half an hour to read – it’s perfect, and it’s a must have for the Rainbow section of your shelf. I’ve been eyeing this book for quite some time! I’m glad I read your review! This novel sounds adorable! I’ll have to get to it soon! I would definitely get it! It was so cute and a great little read.